I go days without thinking of my mother. But the spring, with all of the outdoor plant activity? That makes me think of her. Yes, those were her irises, her hosta. Her double-file viburnum bloomed with abandon this year. And then sometimes I'll be at someone's house and the blue spatterware bowl reminds me of her, or I'll want to share the witty/goofy sets and costumes that enliven the ABT production of Whipped Cream (which I got to see at a dress rehearsal last week), or I'll turn over an index card and there'll be her handwriting, correcting someone's address. Yesterday, I was sitting around drinking coffee and reading the Times, and it was one of those Sundays with an extra Times magazine, perfect bound and 90% ads. But I flipped through because you never know and there was a story about splatter-painted floors. The Times made it sound like splatter-painted floors are a thing only ever found in "no-nonsense summer bungalows in Massachusetts." My mother would have begged to differ. Hell, I beg to differ. The first house I remember - the one we lived in from when I was 3 to when I was 11 - was a little suburban house on Long Island, probably built in the 1920s. My parents had no money, but my mother was crafty. She did all of the painting in the house, she made curtains, she even made a hooked rag rug for the hall runner. And when she painted my brother's room, she painted the floor white, and spattered it with red, yellow, blue and black. 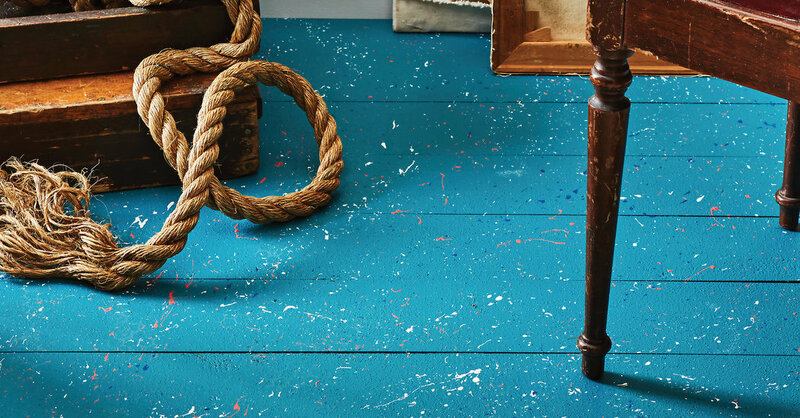 A splatter-painted floor, not in Massachusetts. She'd have had something to say about the Times article, I tell you.